Being won a TheMHS Award in the 2017 Mental Health Service Awards of Australia and New Zealand program for service to mental health for their video series “Into the Light: An Arabic Resource on Psychological Health”. Being won their Award in the Promotions and Illness Prevention category. It was given in recognition of the achievement of excellence, innovation and best practice in mental health services. It was one of 6 Awards made in the Service and Program categories, 3 for Exceptional Contribution, 3 for research and 4 for Media. 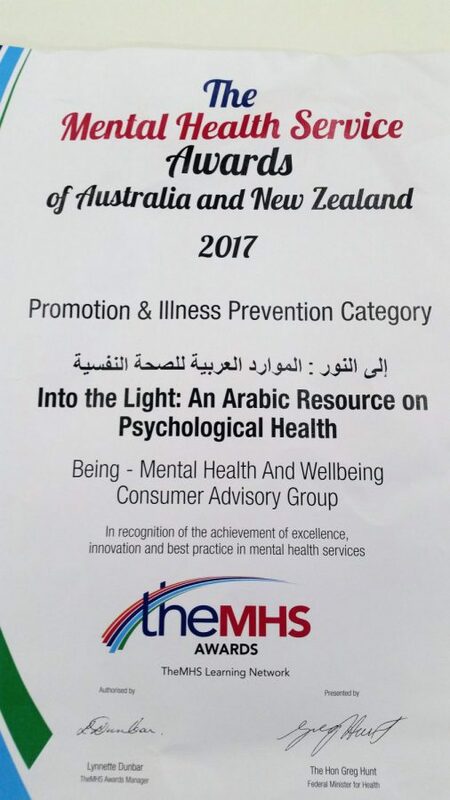 A big congratulations to Being for winning a TheMHS mental health service award for the project – ‘Into the Light- an Arabic Resource on Psychological Health’. ‘Into the Light’ a three-part video resource in Arabic. It aims to engage Arabic-speaking communities in NSW on psychological health, distress and seeking help.This was received by former Being staff staff Ka Ki and Adla. Congratulations to both of them for leading the project during their time at Being. Click the following link to view the Media Release.